Hello and Happy Friday...or as we are calling it in our house, "Turkey Recovery Day"! I hope everyone here in the U.S. enjoyed their Thanksgiving, yesterday. We had a fantastic time with our great group of friends (and the abundance of food that was also in attendance). We were sent home with enough food for at least 3 more meals. Yikes! Today, though, we are in "turkey time-out" and I'm making some good ol' Texas chili for dinner. Mmmm! My only shopping was done from my Mac today, I was not about to brave those crowds. No way! How about you, did you shop today? 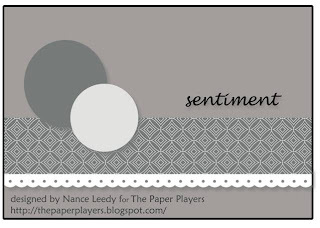 I mentioned earlier this week that I had two other cards that I created from Nance's sketch Challenge over at The Paper Players this week. Well, I almost forgot to post them and the challenge ends tonight. Eeek! You still have 9 more hours to play along with us this week! ;) Also I completely forgot to take a photo of BOTH of the cards before I mailed one of them off on Tuesday. I hate when I do things like that...turkey on the brain, I guess. To distract you from my "whoops", I present you with this ONE happy baby card! How can you not smile with that cute, little, orange giraffe from the Fox and Friends set? Since this card is for a little girl, I thought it would be fun to add "Baby's First BLING" to the card with 2 sizes of pink jewels and some super-shiny ribbon. All little diva's have to start somewhere with the sparkle, right? There are lots of DOTS on this card, to play off that adorable giraffe image. The card came together really easily, inside and out, with the help of my punches, too. I think it is a fun change from using the same ol' pastel colors on a baby card, which really just wouldn't suit the parents of this particular (soon-to-be) munchkin. This darling card just melts my heart! How adorable and sweet!!! I'm loving all the dots...and that scalloped border is so pretty! Have to add it onto my list. oooh...Texas chili...yum! You are way too good. I am too lazy to cook anything...very grateful for all the left-overs. How fun that you made a baby card with bright bold colors instead of the traditional pastels. Cute. Seriously - I LOVE THIS CARD!!! I have this set and for whatever reason haven't even used it yet. I will totally be CASing this when I need another baby card!!! What a great card, love the colors and that giraffe, sweet!!! Sounds like you had a great day and today a wonderful day shopping from home, way to do it. I am pretty much done. Funny we had chili tonight as well, is that a Texas thing? Fabulous colors! I love the bling and your color selection. No shopping for me today either. I can't stand the crowds. Just a little on-line browsing. I'm glad you had a great Turkey Day. FAB card Anne Marie! Love using these colors on a baby card--so modern and I adore how you've used the sentiment as the second element and balanced everything with the brads at the bottom! It's just perfect and I'm so glad you enjoyed the sketch! Have a great weekend! How cute! I love the colors and what a cute layout too! I may have to check that challenge out! Hi Anne Marie, these baby card is fantastic. I like your color choice it looks really good. Not always baby blue and pink !Very, very sweet !! Precious little baby card! LOVE all the bright colors. Oh my, what a breathtaking baby card! The colors are just dazzling and everything about your card is perfect! Well done, Anne Marie! Thank you for your comment this morning! So cute! Perfect for a baby girl! OMGosh! I love these colors together! So pretty! Aw, I love this color combo. It looks really cool as a baby card! What a sweet, bright and colorful baby card! Love that you went with non-traditional colors! OMGosh! I'm still ga ga over your color combos! This totally rocks.